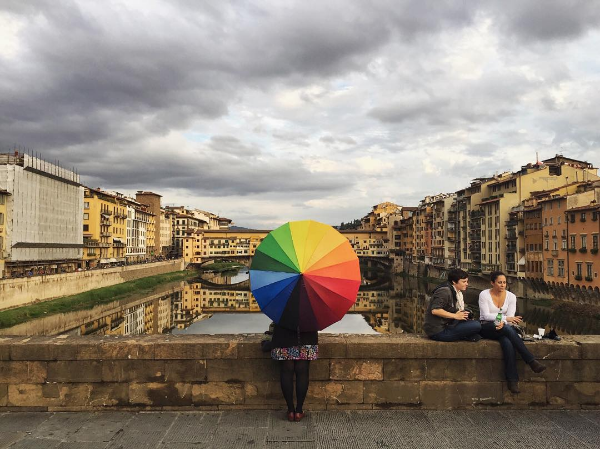 In 2014, I started a project on Instagram by mailing my beloved photography prop - a rainbow umbrella - to a fellow photographer friend. Soon after, more and more friends requested the umbrella. Five years later the umbrella has become insta-famous! It has its own hashtag and has visited a multitude of countries and cities such as Malaysia, Australia, London, Rome, Ireland, New York, LA, Philly, Chicago and more! You can see more than 750 photos of the traveling umbrella on Instagram by using the hashtag: #shineonyoucrayumbrella or by clicking here. It has been written about in various blogs, the Huffington Post, BuddyTruk and Midwest Living Magazine. There is currently a waiting list for the several identical umbrellas that travel! This project is a fun way to physically link virtual friends who all share a love of art and photography. I might not be able to travel the world but my umbrella can! In May 2016, "The Umbrella That Traveled The World" had its own exhibition! The art hung at the Galleria of Edina as a part of the Art of Edina program. My photography was featured as well as over 20 other photographers from around the world. There were also 4 very large pieces created by local artists specifically for the show. Artists include: Chank Diesel, Shane Garron, Erin Sayer, Brandon Werth, Jennifer Davis and Drew Beson. To read more about the show, click here.